The Transport Ministry has come to a consensus on the mandatory use of child seats, with the ruling set to come into effect by 2020. 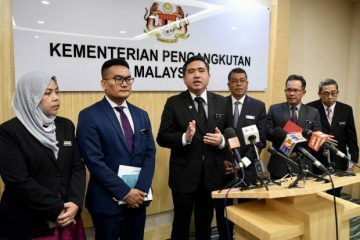 This is according to its minister Anthony Loke in a report by Malay Mail, who added that talks would be held with the Finance Ministry to make child seats exempt from the sales and services tax (SST) to make it more affordable for parents. “The MKJR (Road Safety Council) has discussed the importance of child seats at length today and the government has decided that its usage will be made mandatory by 2020,” Loke told reporters after chairing the 59th annual general meeting of the MKJR, which comprises various government agencies and departments. Previously, the ruling on the mandatory use of child seats was supposed to be introduced in 2019, but was postponed indefinitely as it was the announcement made by the previous government. With Loke’s latest declaration, it is clear that the implementation of the child seat ruling is back on track but he did not disclose what would happen to those who did not comply with the ruling. The transport minister also added that the government will hold awareness campaigns from 2019 to educate the public about the importance of child seats. Also, aside from tax breaks for child seats, the government will also look at other ways to make child seats cheaper, including cutting import duties or providing tax incentives. We at paultan.org strongly believe that under no condition should a child (or any individual for that matter) ever be left unsecured in a moving vehicle. Kids who weigh under 25 kg (weight is a more accurate measure than age) must be placed in a child seat (Group 0+, 1 and 2, fitted in a rear-facing position for as long a period as possible), and those under 36 kg should be secured with seat belts, together with either a booster seat or booster cushion (Group 3). These are absolute necessities, not optional. It’s also crucial that they be seated in the back, and not at the front. This is to position your kids away from the front airbags in case an accident happens. You should only ever place a child seat or booster seat in the front if your car has a front passenger airbag off switch (not all cars come with this feature), but treat this as your last resort. Of course, never hold your child on your lap when sitting in front, or worse, driving. Your arms alone won’t be enough in restraining your child in a collision, plus you would also be subjecting them to the full force of the deploying airbag. This could potentially cause the child a broken neck, a fractured skull and other severe injuries. Lest you forget, you too, will be in harm’s way. There’s no guarantee that using a child seat would save a child’s life in the event of an accident, but the chances of survival are immensely higher, that’s for sure. So, let us all be a bit more proactive when it comes to the safety of our children, shall we? For a better insight into child safety seats, watch the video below.